Following the sold-out success of the previous relaxed performances of Matilda The Musical, we are pleased to announce a fifth at the Cambridge Theatre on Sunday 10 June at 3pm. The Royal Shakespeare Company has been running a programme of relaxed performances in Stratford-upon-Avon since 2013, being amongst the first to adopt and promote the concept. 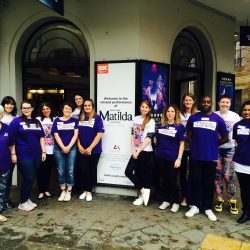 The National Autistic Society and Mousetrap Theatre Projects will again work closely with the RSC offering full access to the theatre for people with autism and learning disabilities and their families. The Royal Shakespeare Company is offering tickets at a reduced rate of £25 and £10 which can be booked through the RSC Ticket Hotline on 01789 403493 or in person at the Cambridge Theatre box office.